From the Managing Editors and the Board of Management of Open City, publisher of RealTime. RealTime is now ceasing regular publishing and will embark in 2018 on the task of completing its online archive and publicly celebrating its legacy of 25 years’ coverage of innovative Australian art. 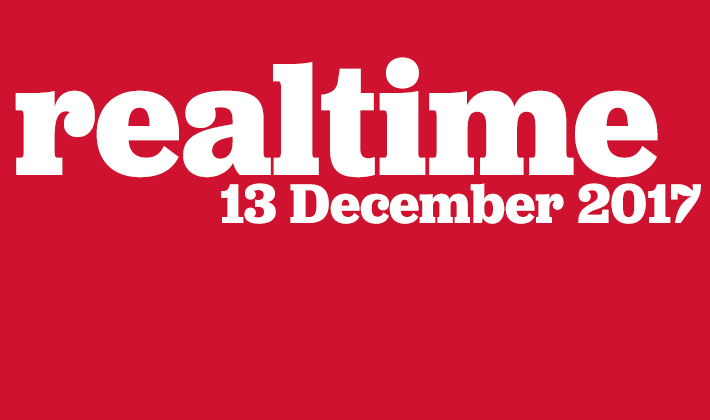 RealTime, the national arts magazine uniquely focused on innovation and experimentation in the arts across Australia and beyond, is coming to an end. In 2018, its 25th year, the magazine will be published informally, but no longer on a weekly basis. Staff will focus on completing and making publicly accessible the enormous RealTime archive from 1994 to the present. This decision, made by the Board of Management of Open City and the Managing Editors and in close consultation with the Australia Council for the Arts, the association’s key funder since the magazine’s inception, was not an easy one. But it was a necessary one. Despite considerable creative and technical effort — and achievement — in 2016-17, it was clear the operation would soon become unsustainable, a result of the widely felt negative impact of social media on advertising sales. Across 2018, the Managing Editors will complete the magazine’s invaluable online archive, issue a number of special editions, commission historical overviews and conduct public forums surveying the period from the mid 1990s to the present of monumental change in the arts, much of it not easily accessed or otherwise on the public record. The archive, including digitised print editions of 1994-2000, will be freely available to artists, audiences, students and researchers with a plan to house it within a major arts institution. Above all, the archive pays tribute to the work of the thousands of artists who inspired RealTime’s Managing Editors and writers with their bold reshaping of forms and genres, their experiments in hybridity, their embrace — and critiques — of new media technologies, cross-cultural exploration, art-science cross-pollination and the complexities of ethnic and gender identity. The archive will equally pay tribute to the contribution of hundreds of writers, many of them artists and arts specialists, who have written generously for RealTime, some of them for over two decades, responding constructively in creatively turbulent times. We deeply regret we can no longer commission them to review new work by emerging and established innovators that warrants serious attention at a time when arts journalism is seriously threatened. The archive also represents a record of RealTime readers’ keen embrace of experimentation in Australian art. Our supportive advertising clients allowed us to commission extensively and our sponsor Vertel provided us with several years of superior network capacity. The Australia Council for the Arts, from a seeding grant in 1994 for RealTime to its funding of Open City as an ongoing key organisation, has been a consistent and responsive funder of the magazine, its support allowing a significant breadth of national coverage and a focus on art that often defies categorisation and is ever enquiring. The Board and Managing Editors pay particular tribute to the staff of RealTime who, across the decades, have been hard-working, generous, loyal and committed to supporting innovation in the arts. The Open City Board, Keith and Virginia proudly welcome the opportunity to complete the RealTime project in 2018 and look forward to engaging with artists, writers and supporters in our grand retrospective of 25 years of transformed and transformational art.